2004 Holiday Gift Bag by Neefer. It doesn’t look much different from the last picture. 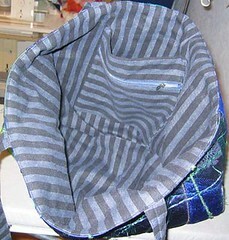 I used a heavy weight striped denim to line the bag and construct the handles. Denim is so easy to sew! 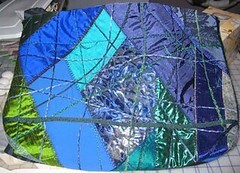 To the left is a closeup of the tulle applique. I think it came out really neat. The tulle is blue with silver stars printed on it. I cut the moon shapes freehand with my rotary cutter. I had to use a lot of pins to secure them. the other side by Neefer. And here are the handles. I mailed it off more than a week ago, and I haven’t heard if it arrived. Were you wondering if I was going to share the other side of the purse? I’ve been so busy. Chunguita has been sick with a tummy bug. We celebrated my birthday this weekend. I’m 40, today. Anyway, I celebrated on Saturday with DH, Chunguita, and Pulguito. They gave me an espresso machine which I LOVELOVELOVE. On Sunday, we got all dressed up and drove into Oakland to meet my family at Kincaid’s. Kincaid’s used to be my favotire restaurant, and this time it was okay, but not great, kinda salty. The last time, it was just awful, but I had totally forgotten that. Right when the soup and salad arrived, Chunguita threw up on DH. He had managed to get her away from the table, so she threw up on the floor and on him. So we ended up leaving early. I remind myself that it was to experience things like this that I had children. I didn’t get any sewing done this weekend. I started this side of the bag with the same burnout panne as on the other side. On this side, in addition to the unstable stretchy panne problems, I had problems with a polyester silky fabric. I didn’t have trouble with it on the other side. 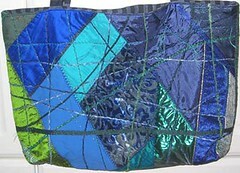 I think the difference is that on the other side, it was an interior fabric; that is, it was sewn down on all 4 sides. On this side, it was at the edge. I had terrible problems with it bagging. I don’t know if I stretched it or what. Note to self: interface this sort of fabric before using for crazy patch. I used decorative stitches on the seams. On one seam, I sewed down a wide velvet ribbon. 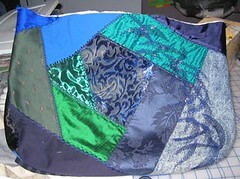 It looks like another bit of the patchwork. On top of everything I couched yarns and threads. I used to really like this look, but I think I’m ready to move on to something new. Things are so busy that I haven’t touched my sewing. My cutting table is covered with boxes that came in the mail for xmas gifts. I had a few seconds before the kids came home, so I snapped a couple of pix of the bag for you-all. 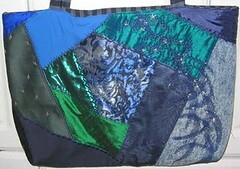 The recipient of this bag suggested green, navy, and black as her preferred colors. She’s the second person to request green, and I’m starting to run out of green scraps (time to shop!). So I used blues beyond navy. 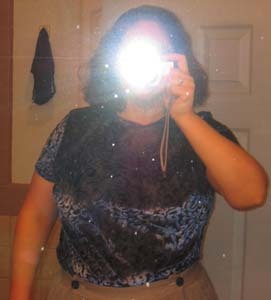 The center patch is a polyester stretch burnout panne from Joann’s last year (see t-shirt to the left). I don’t usually use knit fabrics for crazy patch. They are too unstable to support the embellishment process even when backed with muslin. If I could remember things for more than 2 seconds, I would have interfaced this fabric before using it. Alas, I did not. On this side, it didn’t matter so much because there isn’t much embellishment on the panne. I really like the way the tulle appliques came out. I used a decorative stitch along one side the attach them. If I do this again, I must remember to embellish the seams BEFORE doing the applique. You can hardly tell, even in person and upon close examination, but the seam embellishments go over the appliques. This is another gift. This one took me a few evenings and one 8 hour day devoted to design and sewing. 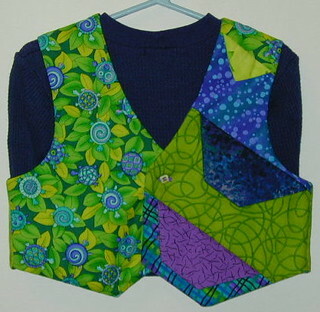 I used the vest from the Little Sprouts’ Wardrobe by k.p. kids & co.
Because I was very time limited on this vest, I designed each piece as I went. To simplify the vest (and ensure that I would finish it in time), I decided to make one front on each side out of a single piece of fabric. For side A (above), I chose the turtle fabric and pulled about 50 different fabrics from my stash to go with the print. I didn’t have time to narrow the fabric selections. 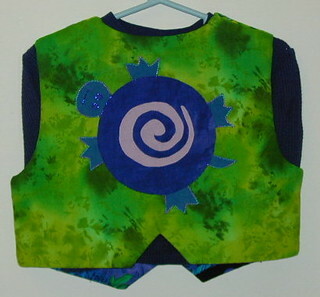 I repeated the turtles in a big applique on the back of the vest using a turtle pattern from Colorful Quilts for Kids by Kari Pearson. 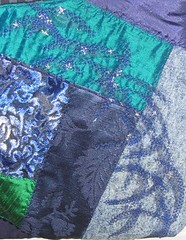 The edges of the appliques are zigzagged. 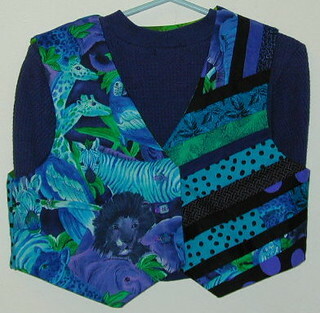 For the second turtle front, I used Judy Murrah’s “Lucy Loo’s Pockets” from Jacket Jazz Encore. 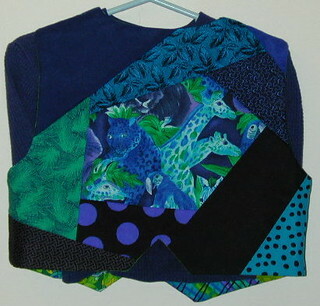 The feature fabric for side B is the African animals print in teal, green, purple, and black. For the back, I did easy crazy piecing with no embellisments, and for the front, I copied one of the styles from Carol Doak‘s Easy Reversible Vests. Once the fronts and backs were done, I put the vest together using Sandra Betzina‘s Gold Medal Vest Lining. This method will give you a perfectly reversible vest. You can’t tell which side is the lining and which is not. I’ve had a change of heart with respect to buttonholes. After reading an article in Threads 98, I embraced a 2-pass buttonhole method as recommended by Sandy Sweeney.